Well it seems ATLUS didn’t come to E3 empty handed this year after all. At E3 they released an “English” language version of a Japanese trailer we saw months ago... Yay? I also write English in quotes as there is no actual dubbing done either by the way. The interesting thing about the trailer however is the fact that Persona 5 as per Youtube is still stated to come in 2015. As in this year. I’m hopeful but I really am doubtful. Why would Sony not beg ATLUS to let them use one of their biggest JRPG’s coming out that’s an actual real exclusive for their Press Conference? Especially if it’s coming out in 2015. Something is fishy, also the fact its only on Youtube and not in the actual trailer a key piece of information you think they’d like to share makes me VERY suspicious. 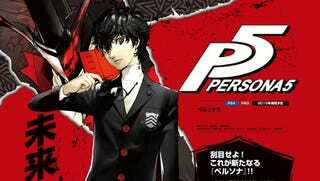 That being said I’ll gladly eat my shoe if this turns out to be real as long as I have Persona 5.